The use of the hardware based ICE scratch and dust removal is standard (if technically possible) and ist therefore included in all prices. Please note that a film scanner only knows the landscape format; pictures in portrait format have to be rotated after scanning if you want to watch them on the screen. If you live close to Munich, of course you may deliver and pick up your film material personally. In this case there are, of course, no extra shipping costs. Please, contact us before if you plan a trip to Munich. By the way, Munich is always worth to be visited! Important note about data backup: You will get your scans either on DVDs, USB-stick or on an external USB hard drive. DVDs, USB sticks and USB hard drives have an average expectation of live of many years, however, they can also break after a short time or loose their data. Therefore it is necessary by all means that you check the data and make an additional backup immediately after receiving the storage media; we delete your data after approx. 4 weeks irrevocably. Important: Please, send or bring us only the film material to be digitized, i.e. no photo collections from which only a couple of marked pictures are to be digitized. We scan and bill all the pictures sent to us. It is not possible for us to handle film strips or film rolls with particular marked pictures. The mounts may be made of glass or plastics. The slides may be stored in magazines, slide boxes, slide cassettes, small boxes, or archiving sheets. We maintain the natural order of slides in magazines or boxes as far as possible. Slides in archiving sheets are being scanned from top left to bottom right. Slides in other boxes or packagings can only be scanned in a certain order if the order is clearly marked. We store the files in folders, which we name e.g. according to the magazine name, or we number the folders according to the archive sheets. Please note that we use a special scanning method for Kodachrome slides and cardboard slide mounts. Hence we charge other prices for Kodachromes (see next chapter). For your order, please, choose on our site Order Form the order form for slides/negatives. The mounts may be made of glass, plastics or cardboard. The slides may be stored in magazines, slide boxes, slide cassettes, small boxes, or archiving sheets. You can find detailed information about scanning of Kodachrome slides on our website about Kodachrome films. We maintain the natural order of slides in magazines or boxes as far as possible. Slides in archiving sheets are being scanned from top left to bottom right. Slides in other boxes or packagings can only be scanned in a certain order if the order is clearly marked. We scan Kodachromes manually with the Nikon Super Coolscan 9000 ED, the only film scanner having a special colour profile for Kodachromes and providing the ICE scratch and dust removal for Kodachromes; that's the reason for the surcharge for Kodachromes. The film strips (24 x 36 mm picture format) may be in envelopes, sleeves or archival pages. Adhesive strips beeing fixed by photo labs when ordering extra prints have to be removed, since only plain film strips can be fed into a film scanner. We process film rolls with lenghts from 2 up to 40 frames. For singular, loose pictures there is an extra charge since they have to be scanned separately using a special film holder. We scan only complete film strips or rolls, the selection of single frames from a strip or roll is impossible to handle. If you want specific pictures from a film strip or roll to be scanned we recommend to cut the specific frames out from the film strip and put them into mounts. Film strips in archival sheets are being scanned from top left to bottom right. For each photo envelope or archive case we create a file folder which we name according to the label of the photo envelope or we just numerate them. Negatives are converted into positives automatically, i.e. you will receive normal pictures which you can see at the screen or print out. The conversion of a negative into a positive works automatically in the scanner software; there is no additional rework necessary. Diffused light effects may occur when scanning film strips. We do not offer multi exposure scans for film strips; as alternative we recommend multiple scans. Note: For negative films we recommend the option GEM film grain smoothing. This increases the image quality for negative scans considerably. Scans of paper prints, photographic prints, documents etc. With our Canon/Epson scanners we scan photos, paper prints, photographic prints and documents, i.e. each reflective material up to a size of 31 x 44 cm. For reflective material a resolution of 600 dpi is usually sufficient. If old photos have a jagged or waved frame around the actual image we scan only the inner image area. We can expand the scan area if desired, see our page special requests. Please, send us your paper photos loosely or in archive folders. Photos, which are adhered in photo albums, are difficult to handle. That's why we demand a surcharge for that. Reflective originals like photographic prints, documents etc. For your order, please, choose on our site Order Form the order form for paper photos. Developed APS films are scanned directly from the cartridge, i.e. the scanner extracts the film automatically from the cartridge like a camera does. We are able to process any kind of APS films, negatives or positives. However, only complete film rolls can be scanned, we cannot handle lists of frames to be extracted from the film roll. Non developed APS films cannot be digitzed. Every APS film has a unique six digit number, for example 123-456. For every APS film we create a folder with exactly this number, so that the folder can be easily assigned to the appropriate film. 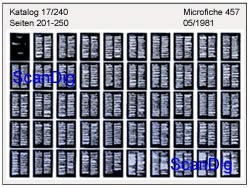 Special offer until 31.03.2019: 0,36 € per APS scan (arbitrary resolution, arbitrary format JPG/TIF/TIF48), minimum quanitity: 500 scans. Please, write "special offer" on the order form. If you want your APS films to be digitized within our special offer, please write "special offer" in the field "notes" on the order form. For special offer orders we have a working time of 2-4 weeks. If you send us your APS films regularily, the working time is 3-4 working days. Note: For APS films we recommend the option GEM film grain smoothing. This increases the image quality for APS scans considerably. Medium format films are being scanned with the professional medium format film scanner Nikon Super CoolScan 9000 ED in a film holder without glass, i.e. there is no additional glass between the LED light source and the film material. Thus Newton rings can be avoided. We only use special film holders with glass if your film material is strongly curled or curved. This top-quality film scanner can process medium format images sized 6x4.5, 6x6, 6x7, 6x8 and 6x9. We handle panorama images sized 6x12 or 6x17 like large formats. Negatives or positives can either be scanned individually or in film strips or mounted. But a film strip may not be longer than approx. 20 cm. A selection of single frames within a film strip is not possible. It is important that single frames a neatly cut. Please note, that medium format films can only be scanned if we lead the film directly into the scanner. Medium formats, which are stored in a passepartout, have to be removed from it before scanning. We scan all medium formats uncropped. For medium format scans we recommend the option Standard image editing. Please note, that a 6x6 cm color photo has a file size of approx. 60 MByte when being scanned with 2000 dpi and saved in the TIF format. Its file size increases to approx. 240 MByte for a resolution of 4000 dpi. The file size even doubles if the highest colour depth (48 Bit) is used. More about image and file sizes on our page image sizes. We digitze large format films up to a size of 31 x 42 cm. 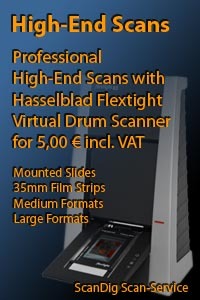 For films up to a size vo 5x7" we use a Hasselblad Flextight drum scanner, if possible. For other large formats we use scanners from Canon or Epson. Please note, that large format films can only be scanned if we put the film directly on the scanner. Large formats, which are stored in a passepartout, have to be removed from it before scanning. Because of using glass film holders sometimes Newton rings cannot be avoided. For large formats greater than 4 x 5" (10 x 13 cm) we use a self-constructed special film holder in which we fix the films. We digitize large formats up to 4x5" normally with a resolution of 2000 dpi, 5x7" with 1600 dpi. Higher and lower resolutions are optionally possible without extra charge. If you order large format scans in the highest resolution the file size will be so large that the images can hardly be processed on standard PCs. Therefore we recommend a lower resolution for large formats with great dimensions. Please inform yourself about image and file sizes of large format scans on our page image sizes. For your order, please, choose on our site Order Form the order form for special formats. 35mm panorama films (24x58 mm / 24x66 mm) are being scanned with the precious medium format film scanner Nikon Super Coolscan 9000 using a self constructed particular film holder or with a Hasselblad Flextight drum scanner. We can process only single frames, no film strips or film rolls. If you send us film strips or film rolls, we cut them into singular pictures. Of course you can send uns also framed 35mm panorama pictures. By default we digitize 35mm panorama films with a resolution of 4000 dpi. The scan of a 24x58 mm picture yields a digital photo with approx. 34 million pixels, which corresponds to a file size of about 100 Megabyte in the uncompressed TIF-format. A 24x66 mm film results in about 39 megapixels, i.e. a approx. 120 MB file size. Lower resolutions are possible, too, however the price per image does not change. We can digitise unperforated rollfilms with a Canon scanner. The film is 35mm wide and can be of any length. The image format usually is 36x30mm and thus it is higher than the image format of an perforated 35mm film (36x24mm). Rollfilms can contain hundrets or even thousands of single frames. We scan the single images sequentially using a film holder which we constructed ourselves. We scan only whole film rolls, a selection of single frames is not possible. We digitize your films with a resolution of 2000 dpi. With a film format of 36 x 30 mm this results in digital photos of about 7 million pixels. Other resolutions are optionally possible; the price per image does not change with other resolutions. We also scan rollfilms/microfilms of other sizes. Please contact us, if you have a special film type. We digitize your Minox films with professional film scanners from Nikon. There are Minox films on film strips or in special mounts. We can digitize both film strips and mounted frames. Minox-Films have a film format of 8 x 11 mm; it is also called Minox format for Minox cameras. The film area is with 88 mm² about 10% of the area of a 35mm film (869 mm²). We scan Minox films with a standard resolution of 2800 dpi resulting in digital photos of about 1 million pixels. Other resolutions are possible; the price per image does not change, however. You can send us your Minox films either in single strips (10 frames on a strip), in Minox archive sheets, or singular pictures in mounts. We always scan complete films, i.e. a selection of singular frames is not possible. Adhesive strips etc. have to be removed bevore scanning. Minox films have to be corrected in a picture editing program after scanning because of their high age. We offer this image editing with our standard image editing option. During the last century the 16mm film (110 film) has been used both for movies and sub-35mm photography. The film width is exactly 16mm, the oneside perforated film contains images lengthwise. Depending on the camera design the frames are between 14mm and 20mm long, the standard pocket format is 13x17mm. We scan such 16mm films with the professional film scanner Nikon Super Coolscan 9000 ED using a special film holder for 16mm films. Adhesive strips have to be removed from the film before scanning. For singular, loose pictures there is an extra charge since they have to be scanned separately using a special film holder. Pocket films are usually very old and have colour faults; also they are often not ideally exposured since simple pocket cameras were used. Scans from 16mm pocket films have to be postprocessed in an image editing program. We offer this service with our image editing option. Higher or lower resolutions are possible, too, however the price per image does not change. We scan your 35mm films with 24x24mm film format using a self constructed special film strip holder. The quadratic film format was mainly used by Robot cameras. It is a normal 35 mm film with perforations at the upper and lower film edge (see picture), however with 52 pictures instead of 36 on a film roll. We digitize your 35mm films with 24x24mm format normally with a resolution of 2800 dpi resulting in digital photos of about 7 million pixels. Other resolutions are optionally possible; the price per image does not change, however. You can send us your 24x24mm films either in film strips or in film rolls. We always digitize complete films, i.e. a selection of singular frames is not possible. Adhesive strips etc. have to be removed before scanning. For singular, loose pictures there is an extra charge since they have to be scanned separately using a special film holder. 24x24mm films have to be edited after scanning in an image editing program because of their high age. We offer this image editing with our standard image editing option. We digitize your Instamatic films with a self constructed special film holder using the big Nikon Super Coolscan 9000 ED film scanner. Kodak Instamatic films have a quadratic film format of the size 28x28 mm, the film width is 35mm like for 35mm films. Instamatic-films are also denoted as as 126 films. Instamatic films can be recognized by the one-sided perforation and by captions like AGFA SAFETY FILM, PERUTZ SAFETY FILM, KODAK SAF.ETY FILM or AGFA XR 200. We scan your Instamatic films normally with a resolution of 2800 dpi resulting in digital photos of about 10 million pixels. Other resolutions are optionally possible; the price per image does not change, however. Instamatic films are usually very old films so that higher resultions than 2800 dpi cannot be obtained from the film material. You can send us your 28 x 28 mm Instamatic films either in film strips or in film rolls. We always digitize complete films, i.e. a selection of singular frames is not possible. Adhesive strips etc. have to be removed before scanning. For singular, loose pictures there is an extra charge since they have to be scanned separately using a special film holder. Instamatic films usually come from the 1960s and have to be edited after scanning in an image editing program because of their high age. We offer this image editing with our standard image editing option. Kodak Disk films were produced beween 1982 and 1998. The film of the size 8x11 mm was developed to be a successor of the pocket film (13x17 mm) which was very successful at that time. There were special cameras for Kodak Disc films, which were very flat, since the disk itself is only 7mm thick. A Kodak disk has a diameter of 63mm; there are 15 negative images of the size 8x11mm on it. We scan your Kodak Disk films with the professional film scanner Nikon Super Coolscan 9000 ED. In order to to that it is neccessary that we cut out the inner disk on which the film numbers are written. By default we digitize Kodak disc films with a resolution of 2800 dpi, resulting in image files with about 1,5 million pixels. A higher resolution is not recommendable due to the coarseness of grains, however feasible without surcharge. 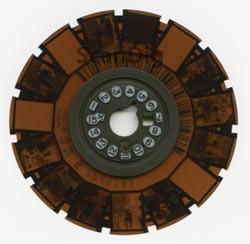 Kodak Disc films are very old and therefore mostly have colour faults and colour changes; also often they were not exposed optimally since very simple disc cameras were used. That's why scans of Kodak disk films have to be postprocessed in an image editing program. We offer that service with our Image editing option. Micro films (also designated as Microform or Microfiche) have been used for archiving documents, drawings, catalogues and graphs. On a small card there could be stored hundreds of text pages. With the help of specific reading devices the content could be projected on diffusing screens. Micro films usually have the flat film format 100 x 125 mm (4x5"). However, there are also micro films on film rolls and film spools. We digitize your micro flat films by default with a resolution of 2800 dpi. This results in an image file of about 180 million pixels. Such an image file has a file size of more than 500 MB in the uncompressed TIF format and can be postprocessed only with high performance PCs. A lower resolution is optionally possible, however some image and text details might become lost. Also higher resolutions are optionally possible, however without additional details in the result, since Micro films normally are not produced with a higher resolution. The price per image does not change if you choose different resolutions than the standard resolution. There are also micro films which exist in form of film cards like the 3M film sort card in the picture beside. Such film cards normally have an outer dimension of 18,7 x 8,2 cm. The cards are made of thin carton and can be labelled with diverse notes. On the card there is a photographic negative with an image size of 5x3,5 cm. We can digitize that negative with a resolution of maximally 3200 dpi. If you whish singular images instead of a large image, which contains the complete micro film, please choose Professional Image Editing on the order form. Then you will get a folder with singular image files per micro film card. By default we scan the singular images from top left to bottom right, i.e. line per line from left to right. If you whish a different scan order, please mention this in the comment field on the order form. For a micro film card with 100 singular pictures we need approx. half an hour if you whish singular image files. Note: Some micro films include text in such a reduced font that they will not be readable after scanning. In such a case the digitalization is not feasible or does not make sence, respectively. We digitize your x-rays up to 31 x 42 cm size. Your material may be classical x-ray pictures or specific magnetic resonance tomography (MRT) images. The standard resolution for scanning x-rays is 1000 dpi. Higher resolutions are possible without surcharge. However, please note that the image files will become extremely large (several hundreds Megabytes) when scanning large images with a higher resolution. If you have bigger images than 31 x 42 cm we can scan them piece by piece and assemble them after scanning to one big image in the scope of our professional image editing service. If you whish that, please choose the option Professional Image Editing on the scan-order form. There are informations about the image sizes and file sizes for different scanning resolutions on our website about image sizes under Large Format Images. We digitize your images on glass plates up to a size of 31 x 42 cm. For that purpose we use precious scanners from Canon and Epson. The glass plates may have a maximum width of 5 mm. The standard resolution for scanning glass plates is 1000 dpi. Higher or lower resolutions are possible without surcharge. However, please note, that the image files of glass plate scans will become very big (several hundred Megabytes) when scanning with a high resolution and can be processed only with powerful computers. There are informations about the image sizes and file sizes for different scanning resolutions on our website about image sizes under Large Format Images. Glass plates should be cleaned from dust and dirt before digitalization in order to get good scanning results. If we receive glass plates with mould we make a primary cleaning on an hourly rate in order to protect our scanners and the scanner operators. Scans from glass plates always have to be edited in an image editing programm after scanning. We offer that post-editing in the scope of our image-editing option. Stereo photos in the 35mm format can be digitized directly from the 35mm stereo mounts. Therefore we use the high-class Nikon film scanners. 35mm stereo mounts usually have the format 101x41 mm and include the two slides which belong together for a stereo photo. The two slides will be scanned one after another and continuously be numerated. The following prices hold for each single scan, i.e. for a stereo mount with two slides the scan price will be computed twice. Since stereo films usually have a very high quality, we set the scanning resolution to the maximum value of 4000 dpi, thus resulting in image sizes of approx. 20 million pixels. Lower resolutions are optionally (without surcharge) possible. We digitize not only photos from different film kinds but also video tapes (VHS, S-VHS, VHS-C, S-VHS-C, Hi8, Video8, Digital8, MiniDV) and film rolls (Super8, Normal8, 16mm, 9,5mm Pathé). You can find information and prices for our video digitalization service on our separate Price list for video cassettes and film rolls.